Are you having conversations with people or prospects? What if you had the opportunity to meet someone and learn about their journey, their passion and why they are where they are today? You might learn that they are working on transforming an organization or that they could make more at another company but they stay where they are because of... company mission? Family situation? Or because of the opportunities to grow? What if your sole purpose was to meet them and understand them? No expectations. No “next steps” in your mind. Just a conversation. Do you think when you leave the meeting, you’ll know what that person cares about? Will they feel like you really listened? Will you be on your way to a better relationship than if you approached them as a “prospect” versus a person? Even if you never do business with this person, do you think they may introduce you to others as a good person to know? In sales, we’ve been taught to leave every meeting with next steps. Move the ball forward, keep pushing, achieve the objective… reach for your goals! We go to solution sales training under a variety of names that tells us to understand the customer, look for solutions and explain how we can help them achieve their goals. We are not taught to have a conversation with the person as a person, not a prospect. There’s a big difference. I just experienced this first-hand and finally get it. After months of trying to meet a top executive who ignored the efforts of inside sales, cold calling and stopping by in person, I was introduced by a previous co-worker as a good person to know. Not my company, not what we do… just me as a person. Given this introduction, the meeting was about meeting each other and nothing else. The big difference? This person wasn’t being “sold to”. All of the “next steps” were their ideas. And not once did I explain what my company does. Have you tried this approach before? What were the results? 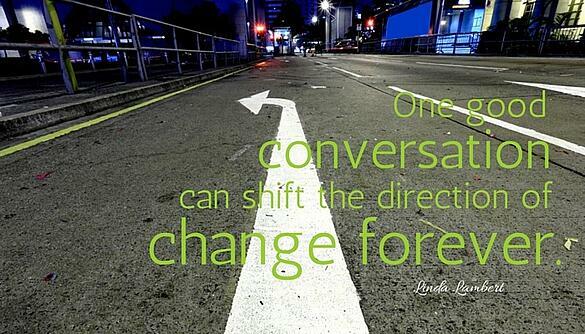 Is it time to change your mindset about conversations and increase sales as a result?